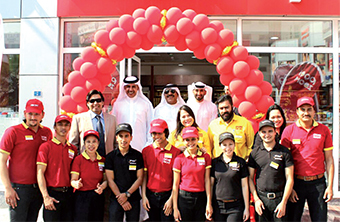 The 24-hour ZOOM Market franchise recently opened its first outlet at the Al Fateh Service Station in Juffair offering customers a one-stop shop catering to all household needs. The brand was brought to the kingdom by Bukhowa Investments Holding Company, one of Bahrain’s leading organisations in the food and beverage industry, operating Yum Yum Tree food court for the last two decades. Its investors, have spent around BD300,000 to launch the first store and set up a second, with two more to follow in Bahrain. The franchise promises to deliver a fast and easy shopping experience to customers seeking convenience and value. Dr Adel Bukhowa, chairman of Bukhowa Investments Holding said: “We are very excited to be opening our first ZOOM Market in Bahrain in such a great location as Juffair. We are planning on launching three more supermarkets in the future in Seef, Janabiya and Muharraq. The two-storey supermarket features an array of products from fresh fruits and vegetables to meat and poultry as well as other grocery and household items such as pet food and cleaning goods. There is also a café style bakery which serves up tasty, freshly made croissants, sandwiches and muffins for busy-bees on the go. The dine-in area is on the first floor offering wifi and TV for those that want to kick back with a cup of coffee or work on their laptops. Also on the first floor is an electronics shop. The store will provide further ease through its extended ZOOM services counter where customers can pay their utility bills, purchase event tickets and phone cards. The market also offers a laundry service and 24-hour home delivery. There are currently more than 165 outlets in UAE and its developers, ENOC Retail Group, believe it will be a great addition in Bahrain. Burhan Al Hashemi, ENOC’s managing director of retail, said: “We are thankful to Bukhowa Investments Holding for the partnership that expands our ZOOM retail concept to Bahrain.